The U.S. Supreme Court often issues some of its most controversial decisions at the very end of its term, and this year was no different. On June 30 – the final day of the term – the high court released its decision in the Hobby Lobby case, ruling that some for-profit corporations have religious rights and can opt out of the Affordable Care Act’s contraception mandate. The U.S. public is evenly split in its view of the decision, according to a new survey by the Kaiser Family Foundation. 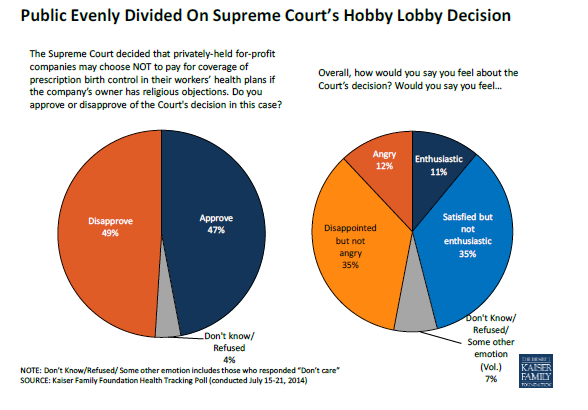 Roughly half of Americans (49%) say they disapprove of the ruling, while a similar share (47%) approve. Neither side seems to feel more strongly than the other: Most people say they feel either “disappointed but not angry” (35%) or “satisfied but not enthusiastic” (35%), and fewer feel “angry” (12%) or “enthusiastic” (11%) about the ruling. Women are slightly more likely than men to disapprove of the Supreme Court’s decision (53% vs. 46%), but there are significantly bigger gaps between political parties and religious groups. Many more Democrats disapprove of the decision (70%) than Republicans (27%), and a far greater share of people with no religious affiliation disapprove of the Hobby Lobby ruling (67%) than do white evangelical Protestants (29%). Catholics, with 49% disapproving, and white mainline Protestants, 43% of whom disapprove, fall in between. Kaiser found a high degree of public interest in the case. Roughly six-in-ten Americans report following news of the decision either very closely (29%) or fairly closely (30%). That’s significantly more attention than was given to other recent Supreme Court rulings, including a decision striking down buffer zones around abortion clinics. The survey also asked respondents about the impact of the ruling – including whether it will lead employers to attempt to deny coverage for other health care services on religious grounds. A majority of Americans – 58% – say it is either very likely (32%) or somewhat likely (26%) that this will happen.